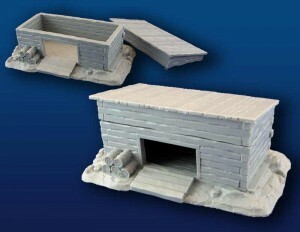 Acheson Creations adds a new piece to their American Frontier line with the release of their 28mm Timber Warehouse piece. We are pleased to announce that the Timber Warehouse, one of the numerous American Frontier items created during our fall Kickstarter, is now available to the general public. A companion piece to our Timber Barn and log cabins, this piece can complete your frontier setting. Sculpted and cast by master miniature maker Craig Acheson, this piece is available for $30USD, unpainted. To all our patrons, and especially to our Kickstarter sponsors, THANK YOU and Happy Holidays! However you spend this holiday season, we hope you are safe, healthy, and surrounded by loved ones. We thank you for your continued support and wish you the very best in gaming and collecting pleasure in 2014.